COP as a learning tool is well established in organizations. To create a collaborative culture and providing a face to face platform for knowledge sharing COP has became a natural choice of many knowledge management systems. The exact frame work of COP and its structure varies with different organizations based on its culture and environment. We will discuss a more generalized structure and try to address them. Organizations start COP model with existing communities and then move to words other domains of strategic importance. During the process the structure remains two layers and with the growth and success of the community the third layer is added. The third layer takes care of external knowledge flow and consists of suppliers, customers, academicians, consultants and other interested parties. At the initial stage mostly there will be two layers. Some community will have one sponsors or key leader who is included in the core or inner layer of the community structure. There can be further division of the structure based on the learning agenda of the community. Some time some members from the outer group takes active interest and became practice leader when the learning agenda falls in their area of expertise. They are kept in the outer layer as their high involvement is not regular. Core group consist of the key leaders of the community who decides on the learning agenda of the community and always tries to build a network among the members for an effective knowledge flow. The success of COP depends on the dedication and hard work of the core group. The core group meets regularly and decides on the agenda of the meeting. Their home work before the community meeting sets the direction for the meeting and has the major impact on the learning and results of a successful community meeting. 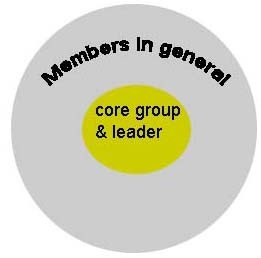 Here are the characteristics of core group members. They are the people who have good understanding of the domain and the knowledge gaps of the domain. They can see the future knowledge requirements and always tries to bridge the knowledge gaps existing in the organization. Establishes the network among the members. They maintain a profile of subject experts and know whom to contact. In a short they are the virtual directory of who's who. They are highly respected among community members and this respect is earned by their voluntary approach and knowledge in the domain. Have sufficient time and priority for the community. They are the members who participate in the community main meeting. They bring their problems, success and lesson learned to the community. They actively participate in the discussions and problems of other community members. There will be another group of members who maintain a low key affair in the community. But that does not mean they are not interested. They are the members who learn from others and keep notes of their learning. They speak little because they don't want to dilute the high learning agenda. Once observed that these members started a new COP and became core group member once they are shifted their location.